We’re so quick to acknowledge other people’s success. We honor our friends when they receive awards, we celebrate a promotion of a colleague, and we pat family members on the back when they achieve something big. For some reason, it’s less likely to see yourself in that same light. Why are you your own worst critic? I get it – I often see the worst in myself, too – it’s a hard habit to break. However, it’s imperative that you don’t block your own success by not giving yourself enough, well-deserved credit. Just like you’d celebrate a win earned by anyone else, do the same for yourself. A culture of winning makes for a stronger culture of accountability and with that mindset, there will ultimately be more to celebrate. Try it for a period of one week – every time your inner monologue starts getting down on something you’ve done and you’re critical of yourself, change the tune and replace that voice with a positive thing you’ve done that day. Do this every time you have a moment of self-critique that’s out of place, and watch how much better you feel and how many more target’s You start hitting. 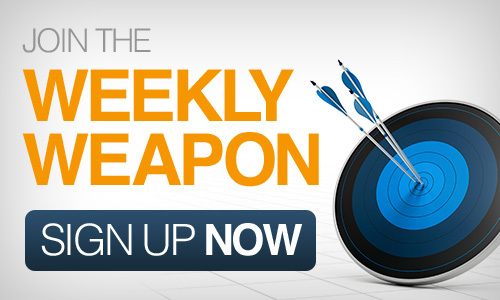 This entry was posted in Your Weekly Weapon With David Farbman on January 31, 2014 by David.